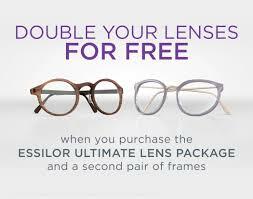 Now until the end of the year, we offer the Ultimate Offer, Double your lenses for FREE with the Essilor Ultimate Lens Package. Purchase an Ultimate Lens Package (either progressive or single vision) and get a second pair of qualifying lenses that is of equal or lesser value at no cost (value up to $900)! The Ultimate Lens Package is a combination of Essilor’s newest and most innovative Varilux®, Crizal® and Eyezen™+ lens technologies, along with the proven performance and protection of Transitions® lenses, designed to give every patient Essilor’s ultimate in vision, clarity and protection in a single lens. They are lenses that are no-glare, photochromic and protect against UV and Harmful Blue Light. The Ultimate Lens Package for progressive wearers is designed to provide the clearest vision possible at all distances while reducing visually disturbing reflections from all directions, and protecting against ultraviolet and Harmful Blue Light. New Varilux® X Series™ lenses feature Xtend™ Technology, which allows the patient to see multiple distances through a single point in the lens, extending wearers’ vision within arm’s reach so they no longer have to search for “just the right spot” to see sharply at any distance. Xtend Technology allows lens wearers to see multiple distances through any point in the near and intermediate zones of the lens which allows for significantly improved vision at distances within arm’s reach. This zone is critical for the modern patient who spends ample time on computers and digital devices. Historically, other progressive lenses have only allowed wearers to see at any one distance throughout specific points in the lens. The Varilux X Series lens is the result of immersing patients in research, testing and measurement from start to finish. Perfected through five years of research and 19 wearer studies with over 2,700 wearers, this lens is so advanced it has 15 new patents pending. Provides sharper vision at all distances, even in low light, by reducing the higher order aberrations found in all progressive lenses. Provides smoother transitions between distance and near zones by calculating the lenses as a matched pair to promote improved binocularity. Reduces the “off-balance feeling” common to progressive lenses by controlling magnification between visual zones. There is no question that we are exposed to continuous light sources in the modern visual environment. Light from computers, digital devices, and screens is something we are exposed to from multiple sources and more angles than ever before. New Crizal Sapphire® 360° UV lenses have Multi-Angular Technology™ to reduce reflections from all directions for less distracting glare, better aesthetics and safer nighttime driving. Crizal Sapphire 360° UV No-Glare lenses offer best-in-class transparency and clarity, as well as superior durability and cleanability. The UV protection is also improved with an increased E-SPF®index to E-SPF®35, providing optimal UV protection in a clear lens. Transitions® Signature® VII lenses are fully clear indoors and darken outdoors. Chromea7™ technology, which is comprised of an exclusive dye formation that makes the lenses more reactive to indirect sunlight and hot temperatures. This ensures your lenses are darkest when you need them most. Transitions Signature VII lenses block 100 percent of UV rays and offer protection against Harmful Blue Light both indoors (at least 20 percent) and outdoors (over 85 percent). As technology has advanced, the demands we place on our visual system have changed drastically. Digital devices, multiple screens, prolonged near-vision work, and the modern demands of life have forced our eyes to work harder than ever before. The single vision Ultimate Lens Package was designed to meet the changing needs of this patient demographic. The new Eyezen design series provide sharp, comfortable vision and a complete range of accommodative relief options for every single vision age group. Eyezen+ is designed with W.A.V.E. (Wavefront Advanced Vision Enhancement™) Technology to provide sharper vision than traditional single vision lenses, and also includes Essilor’s Smart Blue Filter™ feature, which is embedded directly into the lenses and allows for a clear lens that reduces at least 20 percent of Harmful Blue Light. Crizal Sapphire 360° UV lenses with new Multi-Angular Technology™ reduce reflections from any angle of light for less distracting glare, better aesthetics and safer nighttime driving. Transitions Signature VII lenses with Chromea7 technology allows lenses to be more responsive in lighting conditions across all temperatures. The new Transitions Signature Style Colors and Transitions XTRActive Style Mirrors are also an option for single vision wearers of the Ultimate Lens Package. How does the Ultimate Lens Package facilitate eye protection? We are still just beginning to understand the true impact of prolonged blue light exposure on our eyes. As people become more dependent on and immersed in technology, especially at younger ages, there is concern that this added exposure to blue light might have potential consequences to ocular health in the future. While the evidence on blue light damage is not yet decisive, we do know there is at least a possible link between prolonged exposure and retinal disease. We also know that children growing up with cell phones and other digital technology will have a longer life of exposure to blue light damage than any generation before. While blue light is commonly associated with the devices that have defined our digital age, the sun remains the main source of blue light, giving off 100 to 500 times more than digital devices, which is why it’s always important to dispense lenses that protect from Harmful Blue Light both indoors and out. The harmful effects of ultraviolet light on the eyes are well known, and there is concrete evidence to support the fact that UV light can exacerbate and lead to the development of cataract formation and anterior segment pathology such as photokeratitis. Studies have shown that young eyes are more vulnerable to UV exposure than older eyes, which means that most UV damage has been done by the time a person reaches adulthood. However, it is never too late to start protecting the eyes and it is imperative to start early in life as the harmful effects of UV exposure are cumulative and happen over time. The Ultimate Lens Package provides the protection your eyes need. Both the progressive and single vision lens solutions reduce exposure to Harmful Blue Light and block 100 percent of UV light.